Growing up in Detroit we had the advantage of television signals that would dribble across the Detroit River from Windsor Canada. 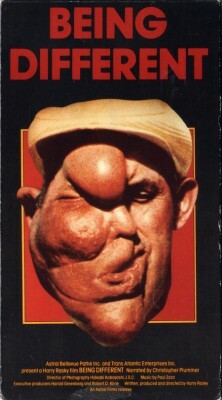 That meant we could see a lot of British sitcoms and TV dramas, Canadian folk and rock music, and occasional oddities like Being Different (1981), a Canadian-made documentary about ordinary people with extraordinary physical anomalies. Still genuinely startling, the picture like many others of its type is part Mondo exploitation (i.e., sensation- and taboo-driven documentary features patterned after Mondo Cane), but also intelligent and heartfelt. Sort of. It's hard to distinguish in such films the fine line between crass exploitation of its subject and underlying disingenuousness of its supposedly heartfelt empathy and pleas for understanding. But that really seems to be there in the best Mondo-type documentaries, such as those of Gualtiero Jacopetti and Franco Prosperi (Africa Addio, Goodbye, Uncle Tom), and it's present here as well. The second half of the film, less interesting, shifts from those using their appearance to make a living to those overcoming their afflictions, often by becoming engaged in sports many would have thought impossible given their condition. It lingers on little people like actor Billy Barty and the annual conventions his organization sponsors. The general tone, expressed by the movie's interview subjects again and again, is that, except for the long-term medical complications accompanying many of their conditions, that they're basically content and lead fairly normal, everyday lives. Indeed, the lack of almost any bitterness at all from virtually everyone is difficult to believe, but perhaps it's true. I was surprised to discover, after some cursory research on the Internet, that many of the people profiled lived ordinary lifespans, and that, surprisingly, a few like the Gaylon twins are still living. At times Being Different uncomfortably straddles the boundaries between empathetic documentary and crass exploitation. The opening scene has Bob Melvin arduously climbing a stairway in the shadows, in footage shot like a horror movie, only to be greeting warmly by his loving wife, a sequence both effective and a bit unseemly at once. Mostly though, Being Different is extremely sympathetic much as Tod Browning's Freaks was a half-century before. Using a "brand new 2016 HD master from the original vault elements" (but nonetheless shot in 16mm), Being Different is presented in 1.66:1 widescreen and generally looks and sounds good. The region-free disc is not rated and has no subtitle options. Included is a trailer and a strange interview with producer Robert Kline, who barely mentions the film other than imply it began after he had acquired the remake rights to Freaks, an odd remark considering that Being Different is a documentary with no resemblance to Tod Browning's drama other than the basic subject matter. Unique, Being Different is Recommended.